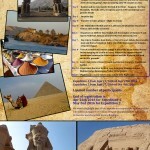 The Great Pyramid of Giza – Are you kidding me ??? The most overlooked aspect of the Great Pyramid is not its construction, but the work done BEFORE to allow the construction. Let’s look at it because it is equally mind-blowing! The pyramid construction started when the ancient builders bulldozered 5 meters of limestone hill (!!) to have a flat base for the forthcoming construction (see picture). 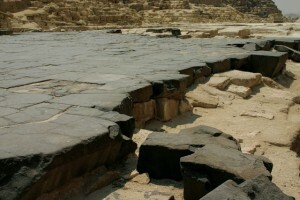 That flat base was completed by assembling stone blocks weighing each around 1 ton. We can find there the same features we find everywhere else in Ancient Egypt: each and every block is unique and they all fit perfectly together. (see picture). The surface created is bigger than 6 football fields and is almost laser flat: only 2cm difference from one side to the other. Even with today’s technology, this would be darn hard to reach. The builders had then a perfectly flat and stable base to build the pyramid on. 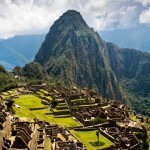 If you checked the previous articles you now know that the pyramid is weighing about 5,9 million tons. Its volume however is around 2,5 million cubic meters moved in (supposedly) 20 years. Hard to imagine what this really represents, so let’s travel back to the future and look at more modern construction sites and their respective volumes and timelines. Remember the Great Pyramid? 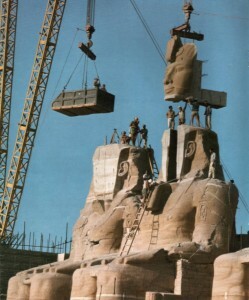 Egyptology claims 2,3 millions blocks (Abu Simbel x 1045), between 5 and 70 tons, 20 years of construction. 20?… Really?? This means that if Abu Simbel was the size of the Great Pyramid, the constructions would have taken…5225 years!! Another exemple. In France, where a clay quarry is being backfilled. 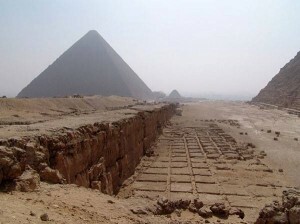 The volume to fill up is only half the one of the pyramid, 2,5 million tons. The construction is still on going. This site requires 1 truck pouring light weighted rubble in the hole every 3 minutes, 24 hours a day, for an estimated 12 to 14 consecutive years only to fill up the hole. What about extracting, cutting, transporting from 900km south, assembling 5-70 tons blocks? Don’t worry, we don’t know either. Once again, if we can’t come close to that with our technology today, how could they achieve this? !